In the 1980s, there was Armatron. It was the robotic arm toy offered by Tandy electronics that started it all. Today, it’s a whole new world. You can control robotic arm kits with an Arduino, programming it via USB, or even with a hydraulic remote. While many robotic arm kits are expensive, you don’t have to spend a fortune to have some fun. The following robotic arm kits will cost you less than $100 (on Amazon, at least). The Arduino is probably the single most popular programmable controllers used by makers around the world. Robotics is also one of the most popular projects for Arduino enthusiasts How to Control Robots With a Game Controller and Arduino How to Control Robots With a Game Controller and Arduino Have you always wanted to control an Arduino with a video game controller? Well now you can with nothing more than this article and an Xbox 360 controller! Read More . So it stands to reason that Arduino-controlled robotic arm kits would also be popular. You’ll find that most SunFounder robotics products are rated well on Amazon. 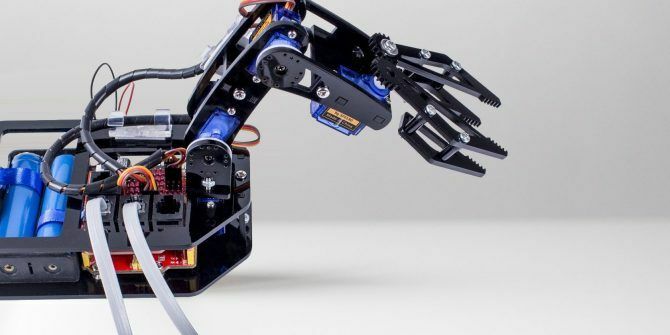 The SunFounder 4-Axis DIY Robotic Arm Kit is no exception. 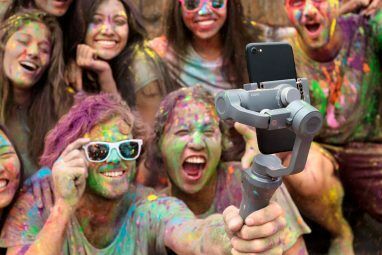 If you’re looking to learn robotic control with your Android, this robotic arm is a must-have. Works with open source MCU Arduino UNO. You can use the four potentiometers on the control panel to manipulate all four axes. Or you could get a bit more advanced and send commands to the arm from your Arduino. This is done via a USB cable and the Arduino serial port. It’s a “smart” robot in that you can “teach” it to perform a series of up to 100 movements at one time. Once programmed, the arm will repeat those movements as often as you like. The ArmUno 2.0 MeArm robotic arm kit is Arduino or Raspberry Pi compatible, and even includes free downloadable software you can start using right away. This is a four-axis arm with four controlling servos. You can also use the Windows-compatible software to control the robot and teach it movements. It’s promoted as coming with laser-cut pieces, but some reviewers noted it feels a little flimsy. 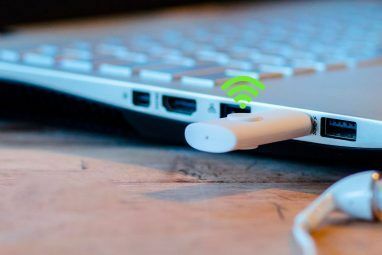 However, the price is very competitive considering it comes with all the software you need. Make sure you have an Arduino or Raspberry Pi before you order because you need one for the robot to work! Assemble it in no time with just a screwdriver. Review the wiring schematics and source code at the Microbotlabs website before you buy so you know you have everything you need. If you really want to try something different, consider building a hydraulic robotic arm kit. These kits are perfect for learning about hydraulic controls, and are easy enough for kids to assemble. Forget about batteries and servos. This OWI Hydraulic Robotic arm kit is fully powered by water. It also comes with more axes of movement than most others in this price range. You can command up six axes of movement. This includes the wrist in two directions, base rotation, shoulder motion, and a vertical/horizontal reach. It includes a lever control system to control the hydraulics on every axis. This arm comes with 229 parts, so is recommended for ages 12 and up. It’s a very simple but effective way to teach children (and adults!) about the power of hydraulics, and comes with easy to follow instructions. Want to take your robotics skills to the next level? Try assembling and programming a robotic arm kit that comes with a micro-controller built in. The kits below come ready to be programmed. Most programmable arm kits that have as many sensors and features as this one typically cost well over $100. However, since this one is entirely made of wood, it reduces the cost significantly. If you’re more interested in learning about the electronics and robotics anyway, then the LewanSoul Arbit Robot Car Kit is a great trade-off. OWI is well known for making high-quality, durable robotic kits like these. This 187-piece, five-axis OWI robotic arm kit includes a gripper, and 120 degree wrist motion. You can also program the 300 degree elbow range, base rotation, and 180 degree base motion. It even includes a search light on the gripper (for all those objects you need to lift in the dark). The arm kit comes with a wired remote control unit, to manipulate the robot arm. Note: To program the unit to perform a series of automated motions, purchase the USB Interface and software. This increases the price but still remains under $100. Use these robotic arm kits to introduce robotics to kids! The HEXBUG VEX robotic arm is intended mostly for getting kids hooked on building robotics. It provides a LEGO-like building experience. But it does offer a four-axis range of motion at one-speed only. It comes with a four-switch wired remote to control all four servos. Note that some reviewers mentioned that the unit is made of a plastic that the servos are strong enough to bend. Since the robotic arm built can also be made into two other configurations, a chopper and a scorpion. It’s like getting three build kits in one! For the young “maker” in your family, it’s a perfect starting point. Like the Hexbug kit, this UBTECH Builderbots robotic arm kit is geared toward teaching kids about robotics and programming. This is a 357-piece robotic kit that includes an infrared sensor, an LED, and four servo motors. You can control the robot by programming it with proprietary drag-and-drop “Blockly” code via the iOS or Android JIMU robot app. If you’re new to robotics and you’d like a fun project that’ll teach you the basics, all of these robotic arm kits are ideal. For adults, the Arduino-compatible kits will also let you get your feet wet in the microcontroller programming world. While you’re at it, download our Arduino beginner’s guide Getting Started With Arduino: A Beginner's Guide Getting Started With Arduino: A Beginner's Guide Arduino is an open-source electronics prototyping platform based on flexible, easy-to use hardware and software. It's intended for artists, designers, hobbyists, and anyone interested in creating interactive objects or environments. Read More , and once you’re ready, you can buy a robotic arm kit and really go to town with it. Great selection of programmable robotic arms. Thank a lot for the information. Edgar Morales, @bonymorales, from Mexico.